There is a lot of choice today when buying products and services online. As I described in yesterday's blog on consumer confusion, there is broad choice in the physical world as well, whether you are buying a bedspread or consumer electronics. The bottom line of that blog was that the buyer needs to know who they are dealing with and the terms of the sale. It is also the seller's responsibility to be clear on the terms of sale. This is true online as well as offline. Since I often write about travel, the parallel in the real world for reserving a hotel room is that you can call or visit a travel agent, you can call the property directly or you can call the hotel or brand's call center. But more often than not, the search and price comparison process begins with online search. Google and Bing are behind most every search done today on the Internet and those of us that are involved in online marketing understand that these are not utility companies, they are advertising giants in disguise. Now mind you, this is not a bad thing. If they didn't exist to make money, we wouldn't have access to the utility that they provide. 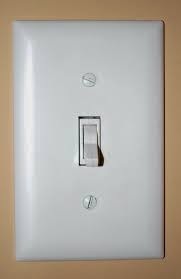 But unlike understanding the power behind the light switch, which simply turns on and off, search provides way more utility and as a result is more complicated to understand. And if you don't take time to understand it, you can quickly find yourself somewhere that you didn't intend to be. Today we are going to look at BING. 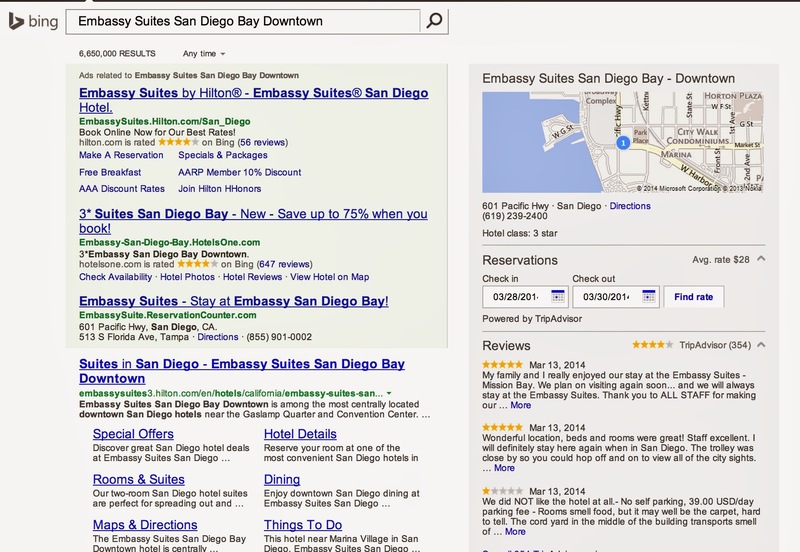 A single search for a hotel room at the Embassy Suites in San Diego on Bing produces over a million responses if you just type in the hotel's name. If you put quotation marks around the actual property name "Embassy Suites San Diego Bay Downtown", you still get 32,100 results. If you think logically, all of these listings cannot possibly be the hotel itself. In reality there are close to 50,000 travel retailers (both online and offline in the real world) that have the rights to sell the Embassy Suite hotel properties worldwide. Any one of those retailers has the rights to advertise on Bing, assuming they have an online site. And while you would think that the first listing should be the hotel, as that would be true utility, remember this is an advertising giant, so that position is for sale. 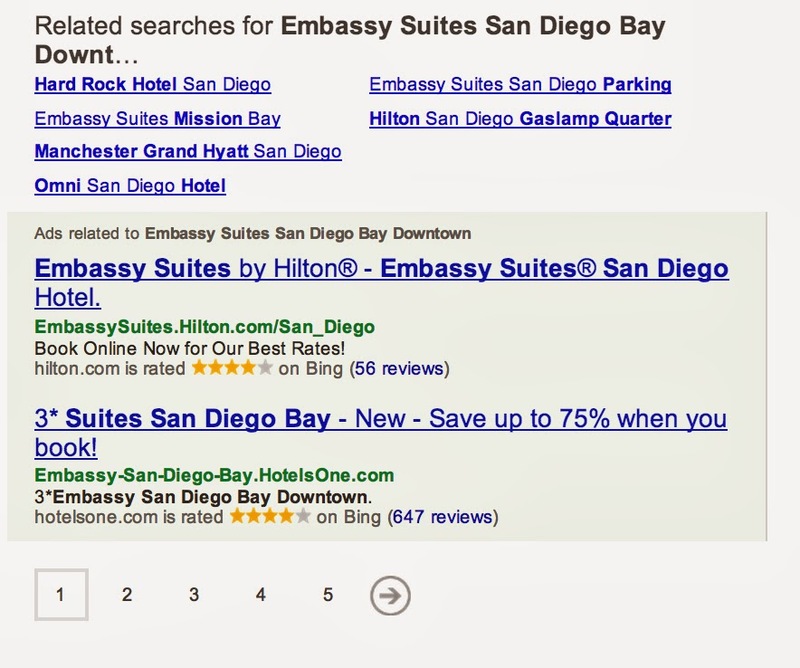 Ads related to "Embassy Suites San Diego Bay Downtown"
This is your notice that these are not unbiased results. They are paid for by the company taking out the ad. And if you remember the days of getting the Sunday paper to get the ads (you may still do this...), the biggest insert is the most expensive. Likewise, the first ad listed brings Bing the most cash. In the case of this Bing display, Hilton.com has actually bid for the #1 position at this particular moment in time. Remember that an hour or a day from now, someone may outbid Hilton and be in this position. And for those not intimate with the complexity of hotel branding, you may not even be aware that Embassy Suites is one of the many Hilton brands. If you click on the first ad, you will see Hilton's logo and the San Diego Embassy Suites page on that site. You can then proceed to book your hotel room. But be aware that many hotel brands now collect up front and sell rooms that are non-refundable. They may use the euphemism "Advance Purchase" but the result is the same. If you need to cancel you can, but don't expect a refund. The second, third and fourth listings in the light green ad box are all third party retailers that have all successfully bid on keywords for this property that result in being included in this coveted ad position. There is science around the positioning and how people behave. And not everyone clicks on the top ad, which is why companies still spend money on ads even if they can't get the #1 spot. 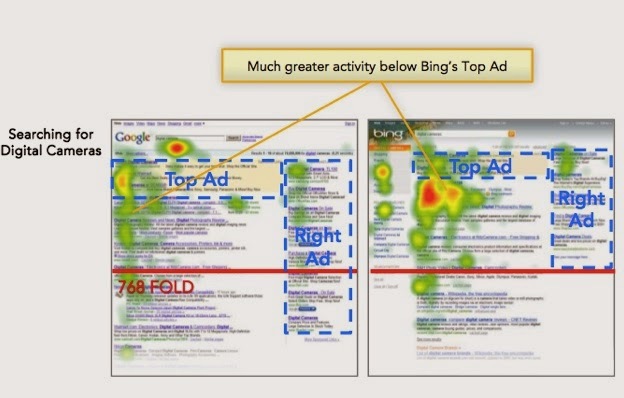 The following image is of a "heatmap", a technology used by advertisers to figure out the best place to advertise online. While this article is a bit dated, the technology is still in use today. If you click on any one of the other ads in the green section at the top, you will land on what is known as a "third party distribution" site. Be aware that they have not "hi-jacked" your search for the Embassy Suites hotel. You clicked on their ad - unknowingly perhaps, but nevertheless, that is what happened. These companies are authorized resellers of the hotel's inventory and their own logo should appear at the top of the site. You will see pictures of the hotel, as the hotel publishes them so that anyone selling their property will represent them properly, giving the consumer a way to visualize the experience. If you wanted to be on the hotel website, you should see their own logo and/or their brand's logo. If you don't see that, go back to search and look for URLs ending in the hotel's name or brand name.com. For those that want to understand the technical terminology behind the online ads, they are also known as "pay per click" and SEM (search engine marketing). The next section below the paid ads is known as the Organic Search section of the site. To be listed here, the search engine needs to find enough relevant content on your site to match what the consumer has searched for. The first listing after the paid ads is generally the hotel themselves, but even this needs to be vetted by looking at the company name just to the left of the ".com". That is the company you are dealing with, no matter what the ad text or a portion of the URL may say. Now one might say (and some chains do say this) that no one should be able to buy their keywords but the brand or property themselves. But this would be like Tommy Bahama not letting Macy's or Boscov's advertise and sell their product. Product distribution is about marrying buyers and sellers - as many of them as you can, at as high a price as you can. Because of this, it is extremely short sighted for brands not to appeal to as many buyers as possible, through as many channels as possible. The next section of the BING display for this property is the map and the section in grey underneath it. Beneath the grey map and booking box, there are more ads. In this case, the only ad listed is from a company called choosearoom.com. While they include the words Embassy Suites in their URL, when you click on the link, you are taken to the choosearoom site. You will know this by their logo, which is clearly placed in the upper left corner of their site. What else would an advertising giant do, but after listing all of the utility content, provide more space for advertisers. These ads are less expensive than the top or right side ads, but are still valuable real estate, particularly on the first page. Here you see Related Searches, which can include other hotels or things close to this hotel, and more ads. Again, we see an ad from Hilton.com and one from HotelsOne.com. OK, you are now as educated as any consumer is on the use of Bing to find a hotel room. You now know that Bing is actually driven by ad revenue, versus pure altruistic desire to help you find what you are looking for (they do that too by the way). Advertisers use Search Engine Marketing (SEM) because it is an efficient way to reach a highly targeted audience. They pay each time you click on their ad, whether or not you book with them. If they are really good at SEM, they don't pay much per click and they always pay less than they make overall on their campaigns. When I say "efficient" though, make no mistake, there are still WAY more lookers than bookers. And it is not unusual out of 100 people that click on an ad for just 1 to buy. Just as an aside, if an online hotel retailer was a physical store selling bedspreads, if 100 walked in and 99 walked out, they would call a high priced merchandising consultant or close their doors. But in online, 1% conversion to a sale is considered the average. Pitiful but true. So when you see that most hotel retailers charge a service fee, it is because they spend alot to attract you and they have to have call centers to answer your questions 24x7, whether you buy or not. They can provide you with more than one property or brand for your stay, allowing you to compare. And many of them also invest alot in building out additional content, including customer reviews to help you plan your trip. Also it is important to understand that cancellation rates for online bookings are often in the double digits and in many cases the retailer doesn't make money unless you actually stay at the property. And because of those high cancellation rates, many hotels have increased the amount of their inventory that is non-refundable, even on their own site. 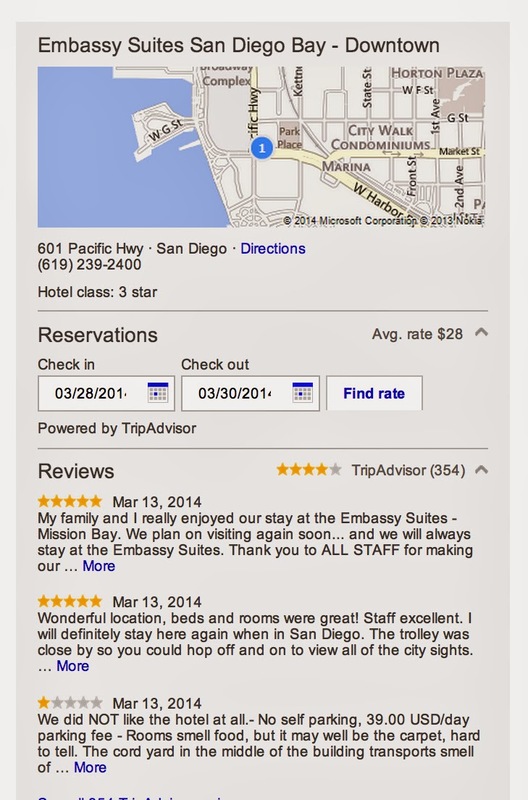 Here, from the Hilton Embassy Suites San Diego site is the availability for their 2 room suite with 1 king bed. The Advanced Purchase (non-refundable rate) is $251 per night, marked down from $279, their "Best Available" (refundable) rate for the room. Tomorrow we will take a look at GOOGLE, the grand daddy of the advertising giants. To read the GOOGLE article, click HERE. Who is the biggest GDS? Fail Fast? I'd rather not. Is the Sabre IPO ominous for the GDS industry? Join over 150,000 followers, fans, and subscribers and follow us by email. It's easy. Just inspire or enable the experience? With TripPlanz Toolkit, you can do both. OK, who is REALLY the biggest GDS?